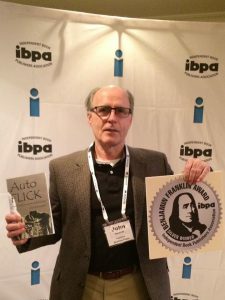 AutoFlick has won a silver Ben Franklin award. The Bill Fisher Award for Best First Book was announced April 7 by the Independent Book Publishers Association at its annual conference in Portland, OR. I was thrilled to be at the award banquet, which was to say the least, a deeply validating event. The Publishing University 2017 conference was hugely informational. Thanks to the IBPA and the awards competition judges.